Ground Floor: Double garages, entry hall, entry porch, kitchen, scullery, dining, guest wc, lounge, patio, buit-in braai, 5 Bedroom (Master Bedroom en-suite with walk in closet), shared bathroom, linen cupboard. This 5 bedroom, single storey house features the potential of two front entrances. The main entrance façade presents a humble french door entrance with an integrated entry porch. The interaction of colour, style and texture are mirrored in the finishing and layering of the internal spaces. The interior features a central lobby and semi open plan layout between the dining and lounge areas. The main bedroom is located far enough from the other bedrooms to ensure privacy to its occupants. The other four bedrooms are located towards the other wing of this 5 bedroom home. Double garage has access onto the scullery which leads you into the kitchen. Three bedrooms share a full bathroom, while the fourth bedroom has a self-contained en suit bathroom. This stunning, thoughtfully-designed, 5 bedroom/3.5 bathroom, single storey home was designed to fit a variety of plot configurations. The 5 bedroom home provides enough room for a large family and yet is still able to provide the necessary privacy in a variety of forms. This house plan is a perfect alternative for a household that values a secure and well-rounded family life. The footprint of this 5 bedroom house is dynamic and features and array of interesting angles and forms. This house was designed to be highly energy efficient for both north and south entry/ facing stands. For an impressive illustration of an entertainer’s home, this 5 bedroom home design exhibits beauty and uniqueness in just one bundle. This contemporary Tuscan house is perfectly designed to offer high end functionality. This 351m2, 5 bedroom Tuscan house delivers a superb layout that a potential buyer can look forward to finding in a modern suburban home. The kitchen in this 5 bedroom double storey house plan is well situated next to all the living places and the spacious entertainment patio. This unique location layout permits the easy access to the outdoors through the entertainment patio. 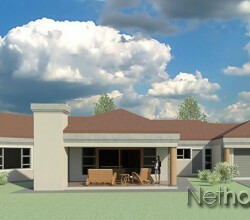 The patio features a built-in braai for those weekends of entertaining family and friends. The dining area alongside the kitchen is similarly beautiful and functional, offering various kinds of dining requirements. This 5 bedroom architectural design is definitely a remarkable home that will fulfill every homeowner’s ambitions.